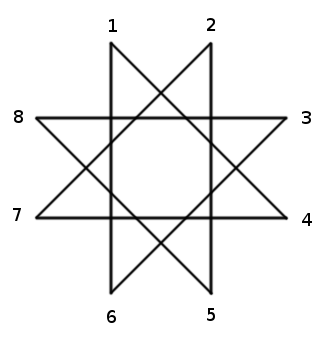 In an Arukone puzzle, the player must connect each pair of matching labels with a single continuous line. 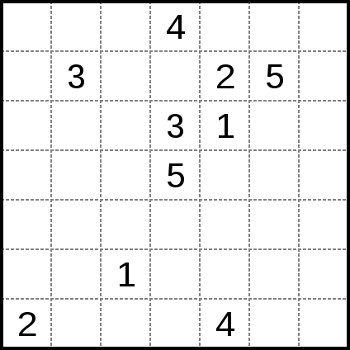 The lines may not cross, and when the solution is complete each cell in the grid must be filled by a label or a line. 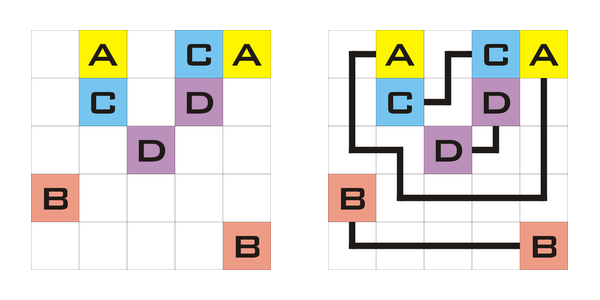 A.G. Buchanan posed this curious puzzle in The Problemist in July 2001. Who moved last? The question seems absurd. 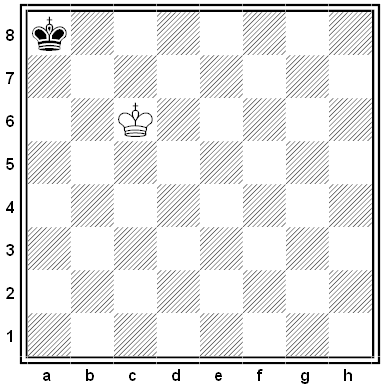 If each side has only a bare king, how can we know which made the last move? The game is drawn when a position has arisen in which neither player can checkmate the opponent’s king with any series of legal moves. The game is said to end in a ‘dead position.’ This immediately ends the game, provided that the move producing the position was legal. In the position above, suppose it was Black who moved last. He cannot simply have moved his king to the corner from a7 or b8, because in that earlier position Rule 5.2b would already have applied: The game would have ended in a draw at that point, and Black would have had no opportunity to move his king to a8. Similarly, Black cannot have captured a knight or a bishop on a8, because neither of those pieces (alone with a king) is sufficient to give checkmate, and again the game would have ended before the diagrammed position could be reached. Black might have captured a rook or a queen on a8. But consider that case: Suppose there was a queen on a8, and the black king was in check on a7 or b8. In that case the capture was forced — Black had no other legal move. And hence even before the capture took place it would have been correct to say that “neither player can checkmate” — the capture was ordained and no possible mate lay in the future. And so the game would have ended at that point, and again we could never have reached the diagrammed position. Hence Black has no possible legal last move, and the answer to the puzzle is that White moved last, capturing a black piece on c6. Because this capture wasn’t forced, Rule 5.2b is not invoked. This is a technicality, but it’s an important one. In 2015 the World Federation of Chess Composition voted that the “dead position” rule applies only to retrograde (backward-looking) problems like the one above. More details are here. 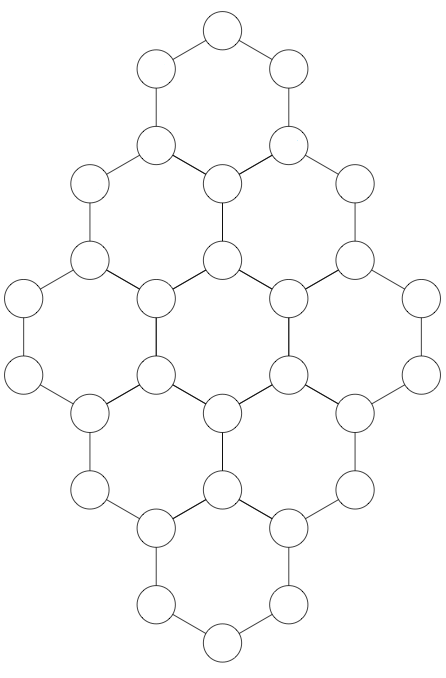 We want to place a coin at each vertex of this figure but one. 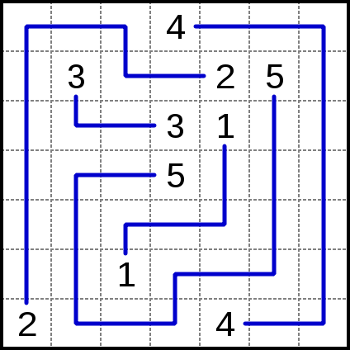 A coin is placed by moving it along a free line and putting it down at the end of that line. A line is called free if there’s no coin at either of its numbered endpoints. So, for example, we might put a coin on 1 by moving it from 4 to 1 and leaving it there. Then we could put a coin on 2 by moving along 5-2, then on 3 by moving along 6-3, on 4 by moving along 7-4, and on 5 by moving along 8-5. But then we’re stuck — there are no more free lines, and we’ve placed only five coins. How can we place all seven? 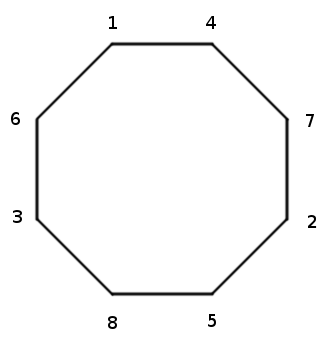 Now the solution is clear enough: Pick any of these numbered points and proceed clockwise (or counterclockwise) around the figure. From Fred Schuh’s Master Book of Mathematical Recreations, 1968. Kriegspiel is a variant of chess in which neither player can see the other’s pieces. The two players sit at separate boards, White with the white pieces and Black with the black, and a referee facilitates the game. When a player attempts a move, the referee declares whether it’s legal or illegal. If it’s legal then it stands; if it’s not, the player retracts it and tries again. This makes for some interesting chess problems. 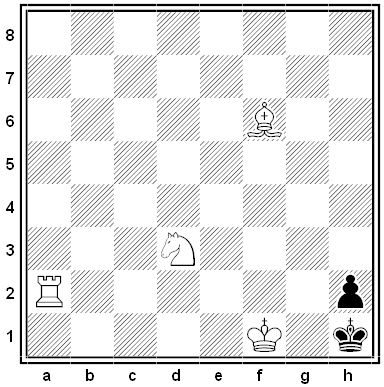 In this example, by Jacques Rotenberg, White knows that there’s a black bishop on a dark square, but he doesn’t know where it is. How can he mate Black in 8 moves? 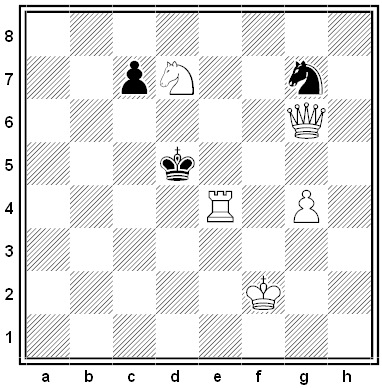 This is tricky, because if White captures the bishop by accident, the position is stalemate. Accordingly White must avoid bishop or knight moves to begin with. The answer is to try 1. Rg2. If the referee declares that this is illegal, that means that the black bishop is somewhere on the second rank and it’s safe for White to play 1. Nf2, giving mate immediately. If the referee declares that 1. Rg2 is legal, then the move is made, Black moves his invisible bishop (his king and pawn have no legal moves), and it’s White’s turn again. Now White announces 2. Rg8. If the referee says that this is illegal, then the black bishop is on the g-file, and White can safely play 2. Be5. Now if Black captures the bishop, then 3. Nf2 is mate; on any other Black move, 3. Nf2+ followed (if necessary) by 4. Rxh2+ is mate. Black moves his invisible bishop again and now White plays 4. Rh5 followed by 5. Rb5 (if that’s not possible then 5. Rh3 and 6. Be5), 6. Rb1, 7. Nf2+ Bxf2 and 8. Kxf2#. White wins in eight moves at most. In order to travel safely from a2 to b1, the white rook must pass through h8! In 1882, a mysterious man using a false name married and murdered a well-to-do widow in Essex County, New York. 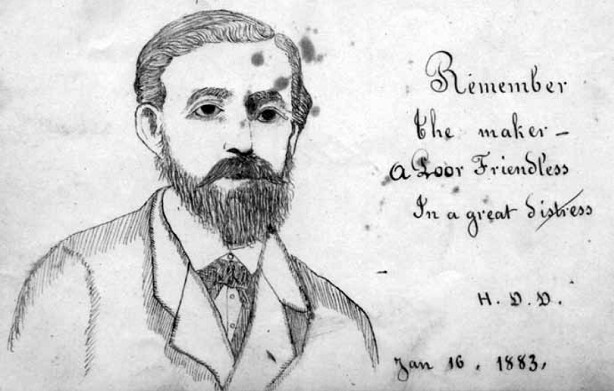 While awaiting the gallows he composed poems, an autobiography, and six enigmatic cryptograms that have never been solved. 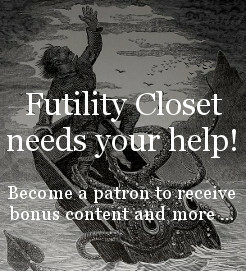 In this week’s episode of the Futility Closet podcast we’ll examine the strange case of Henry Debosnys, whose true identity remains a mystery. We’ll also consider children’s food choices and puzzle over a surprising footrace. Ted: I have two numbers x and y, where x + y = z. The sum of the digits of x is 43 and the sum of the digits of y is 68. Can you tell me the sum of the digits of z? Fred: I need more information. When you added x and y how many times did you have to carry? Ted: Let’s see. … It was five times. Fred: Then the sum of the digits of z is 66. Ted: That’s right! How did you know? If no carrying were involved, we could get the answer by just adding the two digit sums together, 43 + 68 = 111. But each carry increases the final digit sum by only 1 rather than the 10 that would otherwise result. So each carry reduces our expected final digit sum by 9. In this case there are five carries, so the digit sum of the total is 43 + 68 – (5 × 9) = 66. By Rudolf L’Hermet. White to mate in two moves. If he moves his knight, then 2. Qe6#. If he takes the rook, then 2. Qc4#. If he advances his pawn one square, then 2. Qd3#. If he advances his pawn two squares, then 2. Nf6#. From Benjamin Glover Laws, The Two-Move Chess Problem, 1890. 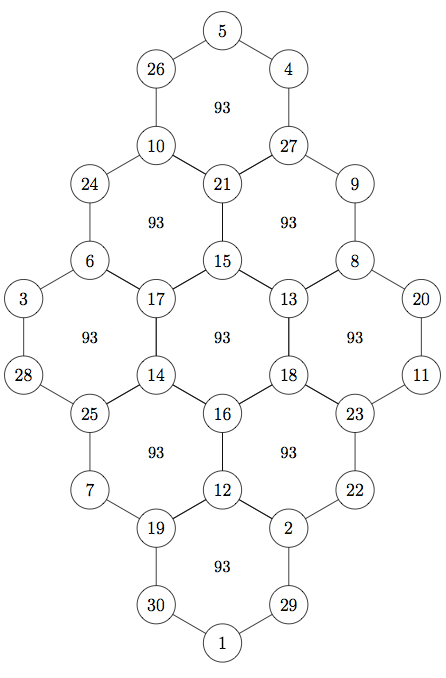 In the 17th century, Korean aristocrat Choi Seok-jeong proposed a puzzle inspired by the pattern on a tortoise shell: Can you assign the numbers 1 to 30 to the vertices in this diagram so that each hexagon bears the same sum? From this we can’t know whether the native is a knight or a knave, but we can tell with high probability. How? If the native’s name isn’t Saul, it’s unlikely that he’d happen to choose that name for a lie. So he’s probably telling the truth, and is likely a knight (named Saul). An urn contains k black balls and one red ball. Peter and Paula are going to take turns drawing balls from the urn (without replacement), and whoever draws the red ball wins. Peter offers Paula the option to draw first. Should she take it? There seem to be arguments either way. If she draws first she might get the red ball straightaway, and it seems a shame to give up that opportunity. On the other hand, if she doesn’t succeed immediately then she’s only increased Peter’s chances of drawing the red ball himself. What should she do? Imagine that Peter and Paula simply take turns drawing balls, without bothering to inspect their color, until the urn is exhausted. Then afterward they look to see who has the red ball. The winner in this procedure will always be the same as in the original, so each player’s chance of winning will be the same as in the original game. If k is odd, then the total number of balls is even, and when the urn is empty each player will have the same number of balls, so each of them has a 1/2 chance of winning. But when k is even, then the total number of balls is odd, and the player who draws first will have an extra ball when the drawing is done. So, generally, Paula should accept Peter’s offer to draw first — it may help her, and at worst it leaves her chances unchanged.